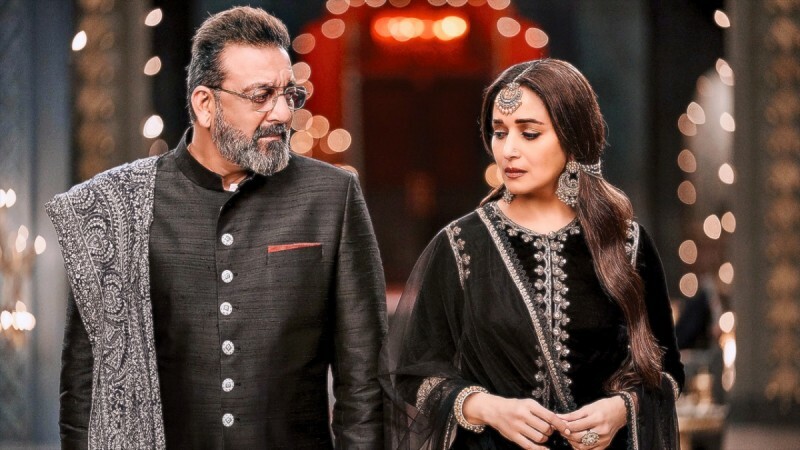 Indian film industry’s renowned television performer, actress and producer Madhuri Dixit, now can been seen with Indian super star Sanjay Dutt in the film ‘Kalank’. Both are performing together in a film after more than 20 years. This happening is being seen by the film watchers as a very big event. The film ‘Kalank’ in which both have been ast is Director Karan Johar’s film. Although the both artists are appearing in only one scene in the movie but as they are together on the screen, after a very long period of nearly two decades, people specially their fans have developed much interest in the film. Keeping in view the position the both artists enjoy, it appears that people are more interested in seeing them on the screen only instead of being ambitious of finding any other thing such as excellent script, music or direction. Both artist are so famous and have so large size of audience that even their names are sufficient symbol of the success of a film.Madhuri Dixit, worked with ‘Sanjay Dutt’ in the peak time of her career, nearly 25 years ago when she was one of the most busy, active and highest paid actresses in the Indian film industry.The actress was born on 15 May 1967. At the time of her cast with Sanjay her age was around 25 years. Madhuri is not only liked by her audience and fans but also fellow actors including Sanjay Dutt who admires her for acting talent. The actress also has won several awards, including Film Fair Awards and Government of India ‘s Padma Shri Award for her good performance. This award is a great honour which is given by the Government of India on Indian Republic Day to the Indian citizens who make extra ordinary contribution in any field such as education, science, arts and other fields of various walks of life. It is also given to those other people who are not Indian citizens but make any notable contribution for India.Madhuri got her commercial successes in the decade of 1980 to 1990. At that time she was working for the films as a full time professional.Again she appeared to be much active in 2007.and then continuously worked in full swing during the whole decade. She also performed in Marathi Drama ‘Bucket List’ which was released in 2018 and earned too much fame and appreciation. There is also a good practice adopted by some artists that they spare time and resources for social service and help those who are in need. This is also the case of ‘Madhuri’. She, in addition to her film activities , also worked for United Nation agency UNICEF. and advocated for the promotion of children’s rights and preventing child labour.